Physiotherapy has been proven to be clinically effective and cost effective in the provision of Occupational Health services. Staff sickness is a national problem covering all sectors of employment. Estimates put the annual cost to the UK in lost hours and productivity at over £12billion, with an average cost of £600 per employee. 11.6 million working days are lost to work related musculoskeletal disorders (MSD's) and of these 4.9 million days are lost due to back pain. The partners at Fairway Physiotherapy Clinic have completed post graduate ergonomic courses run by the Association of Chartered Physiotherapists in Occupational Health and Ergonomics (ACPOHE) and have vast experience in treating work related MSD's. 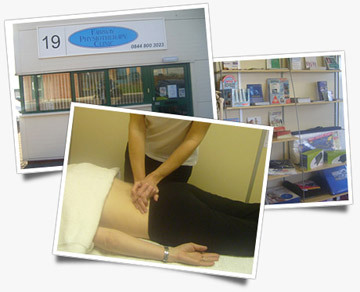 The clinic works closely with several local businesses, providing physiotherapy, as well as larger corporate companies. An Occupational Health service can be provided on site or treatment for employees can be undertaken at the clinic. Physiotherapy will endeavour to keep employees at work or facilitate a return to normal duties. As well as treating the injury, information will be provided to prevent re-occurrence and assist self-management of the problem. There are several well-documented pilot studies that prove the cost benefits to employers of providing a physiotherapy service. Apart from the direct financial aspect, providing this type of facility can help boost motivation, fitness, morale and productivity. For further information please contact us now.